At Northland College, Sack would stare for hours at DeLorme Atlas & Gazetteer, planning what new parts of the Chequamegon Bay area and the north shore of Lake Superior he would explore next. He worked on campus for Outdoor Pursuits, a program that hosted recreational trips for students during the school year, and talked his boss Greg Weiss into ordering “something like twenty 1:100,000-scale USGS maps” and plastered a whole wall of the office in Mead Hall with a mosaic that showed the Gunflint Trail to Pictured Rocks. Sack earned a degree in teacher education, moved to Superior in 2006, and subbed in high schools for five years. Meanwhile, he continued making maps until he eventually decided to go to grad school to turn his hobby into a living. Sack recently defended his PhD dissertation in geography and works as the GIS faculty and program coordinator at Fond du Lac Tribal and Community College in Cloquet. He lives in Duluth with his wife Zee and two kids, Oscar, age three, and Orion who was born in August. When Sack decided to become a cartographer, he didn’t just want to make pretty and useful maps. “I became a cartographer to make maps that change the world for the better,” he said. 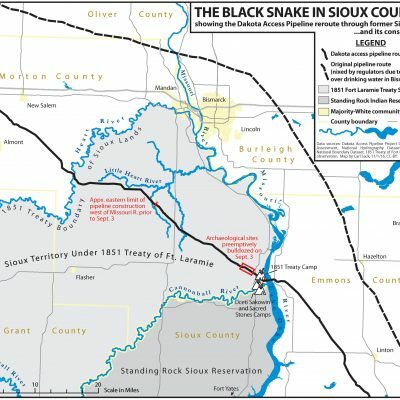 In 2016, he created a map that went viral, The Black Snake in Sioux Country, showing the geography of the struggle of the Standing Rock Sioux and their allies against the Dakota Access Oil Pipeline in North Dakota. He’s also mapped the Great Sioux Nation treaty boundaries as outlined in the 1851 and 1868 Treaties of Fort Laramie and subsequent court decisions, and he made several maps of the proposed Penokee Mine back in 2011-2015. He’s currently mapping the proposed Enbridge Line 3 oil pipeline and the risks it poses to tribal cultural resources. “To me, maps provide an important vehicle for empowering marginalized communities to fight back against environmental and social injustice,” he said. Read, view his maps, and learn more about his process by visiting his blog or his website. Photo of Carl Sack with students by Tom Urbanski/courtesy of Fond du Lac Tribal and Community College. “Maps have the power to define how we see the world. Few people question the authority of a map, yet maps embody the interests of their creators. Take those red townships and range lines on USGS topo maps. They’re part of the Public Lands Survey System, which was created by the Land Ordinance of 1785. Usually, there’s nothing on the ground where those lines are on the map. But those lines empowered white settlers to turn land that Indigenous people didn’t think of as ownable into private property. Social justice begins with decolonization, which means changing the ways we’re used to looking at the world. “Feminist cartography, counter-cartography, and Indigenous cartography are names given to various efforts to challenge colonialist and capitalist map-making. These ideas have been around a while—at least since the 70s, when “Wild Bill” Bunge mapped black children run over by white motorists and rent flows to suburbia in Detroit. The Counter-Cartographies Collective in North Carolina does some interesting work, and Rebecca Solnit’s recent trilogy of cultural atlases is well worth checking out. In promoting the term “resistance mapping,” I’m looking to tie these sorts of mappings directly to activist struggles for social and environmental justice in the face of increasing resource extraction and climate change.